“I find the pastrami to the be most sensual of all the salted, cured meats.” -Seinfeld, Episode: "The Blood"
I don't want to sexualize pastrami, due in part to a fear of Anthony Bourdain shaming me publicly (for any of you who saw him speak at the Fox this past weekend), but I will say that I agree with that Seinfeld quote. 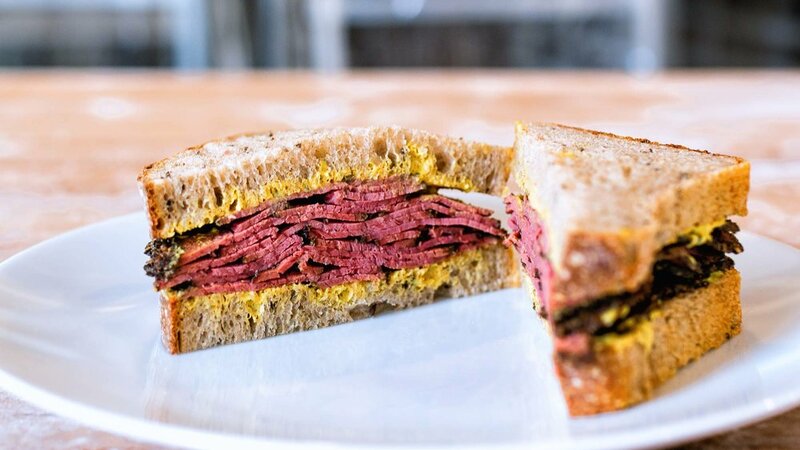 Pastrami is the king of Jewish deli meats. Now, I'm not talking about just any pastrami. To be honest, almost all of the pastrami I've had in St. Louis has left no meaningful impression on me. It's often bland and dry, like the Brits. If I'm going to eat a tower of deli meat, I want it to be worth the calories. But a few months back, Ted Wilson and Brian Lagerstrom, the culinary minds behind Union Loafers, told me a pastrami sandwich was in the works, but not yet ready to be revealed. A month later, I was asked to give a test batch a taste. It was already better than any other pastrami sandwich in town, but not yet up to Brian's meticulous standards. Weeks passed, but I finally received word that the sandwich was complete. It's a mountain of a sandwich, with layers of peppery, thinly sliced hot pastrami stacked high between rye bread with their take on a spicy brown mustard. I've had it 4 times already. My weeks go something like this: Tuesday—trout salad sandwich. Thursday—rare roast beef sandwich. Sunday—pastrami sandwich. I can say with 100% confidence this is the best pastrami sandwich I've ever had in St. Louis. And you should trust me, because I'm Jewish. For the time being (and maybe forever), it's a Sunday-only special, so plan your weekend accordingly.